Are you amongst those who while investing in an under-construction real estate was offered up to 12 percent interest on investment? 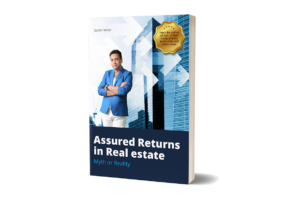 Developers call it assured returns, but do you know that if they fail to give you the assured return there is nothing you can do about it. Can you trust a party who is in a cash crunch situation and promising you fixed monthly cash returns? It has RISKY written all over it. Why do they offer such schemes? They do it for liquid investment and more politically-correct reason given by developers is that these schemes help them to gauge the market sentiments and buyers’ readiness to buy their projects right in advance. Many like you and me fall prey to such unscrupulous schemes all the time. No regulator controls these schemes. So what would you do in case you are duped? Move the civil court, which may take years?